Welcome to our December update. December is one of our busiest, and happiest, months. 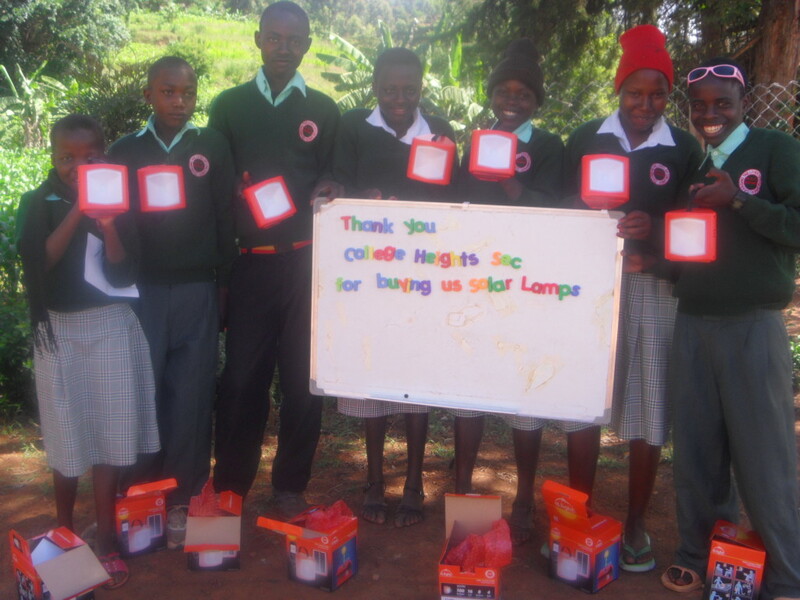 This is a combination of the culmination of fundraising activities by some schools for the first part of the school year, and the Christmas celebrations. 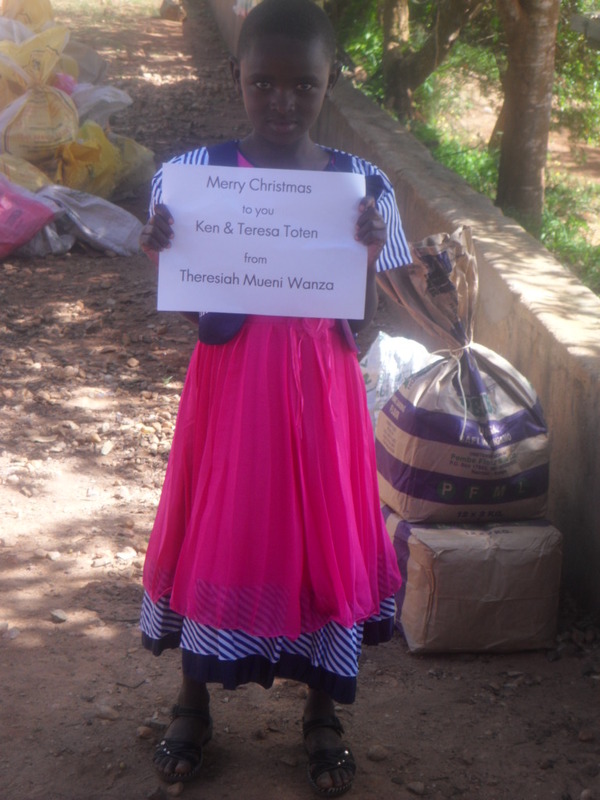 Writing this update I was greeted by so many happy, smiling faces as children received their Christmas presents or sent their greetings to their sponsor. The community distribution day – this year on December 20 – includes not just the usual items (food, uniforms, tools, goats, chickens) but also specific presents for children and their extended families from their sponsors and presents for each child in the orphanage. 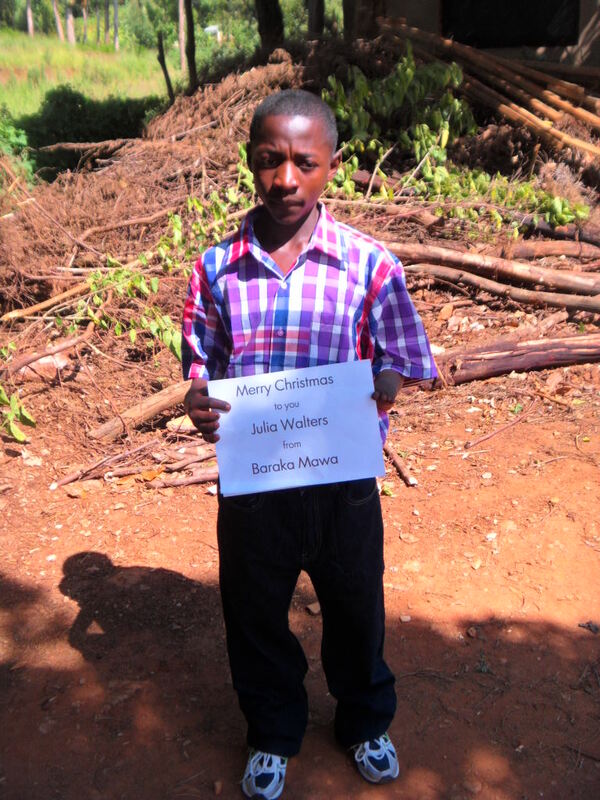 Often these presents involve clothes, school supplies and additional quantities of food or special items. Originally our plans had been to be in Kikima for this celebration but we were not able to attend this year. Hopefully another year I can be part of this amazing celebration. As it now stands we are tentatively planning for another summer trip. Glendale P.S. in Brampton, under the leadership of Melanie – who is also a sponsor of two children – raised $334.90. They have asked that this money be used specifically for education. On a side-note, Melanie and her son, Skylar, visited Kikima last summer to meet their sponsored children and stay at the orphanage. 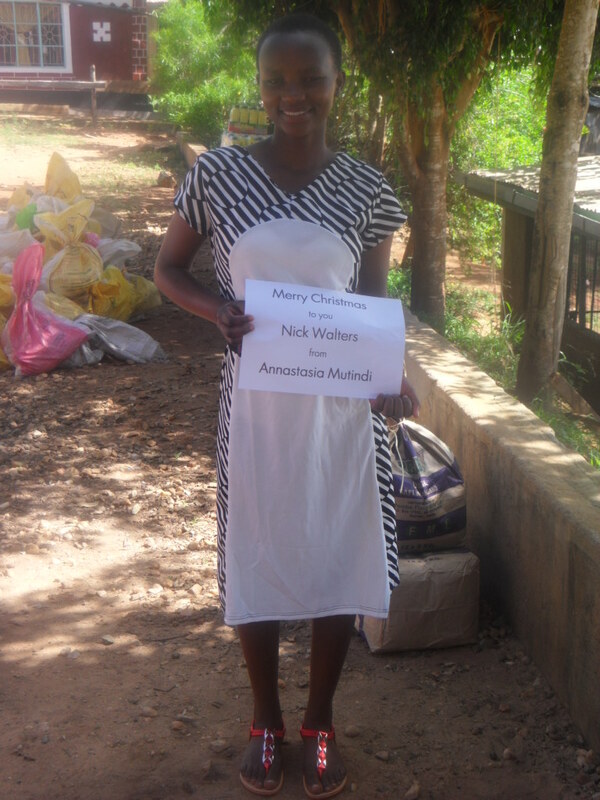 Melanie has now undertaken to provide funding for other members of the extended families of her children. 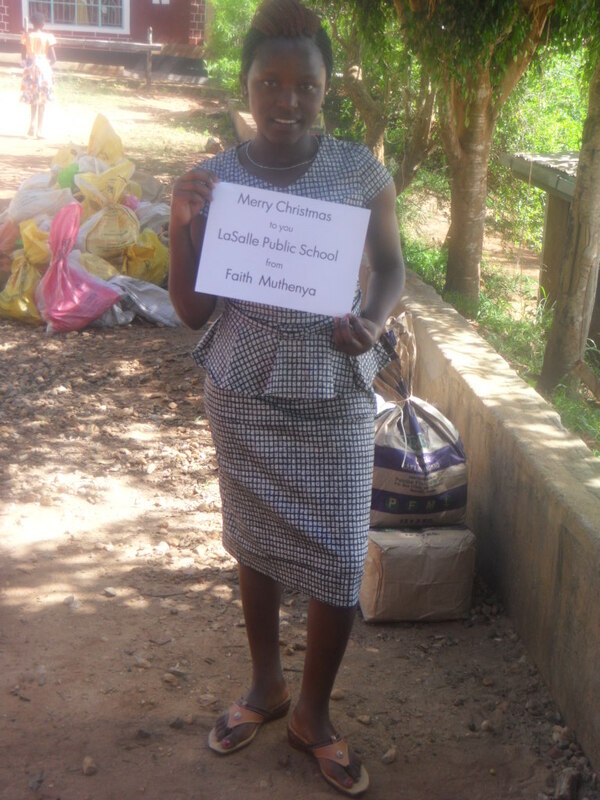 She is a remarkably caring and compassionate person who is so dedicated to the children of Kikima. Immaculata Catholic High School in Ottawa, under the direction of Darlene Charron, Teacher-librarian, and her White Pine Book Club students, raised $702.69. This was raised primarily through the sales of popcorn! We love popcorn! St. Joan of Arc donated $954.63 under the direction of Rosa Tarulli through a program called Taste of Joan! 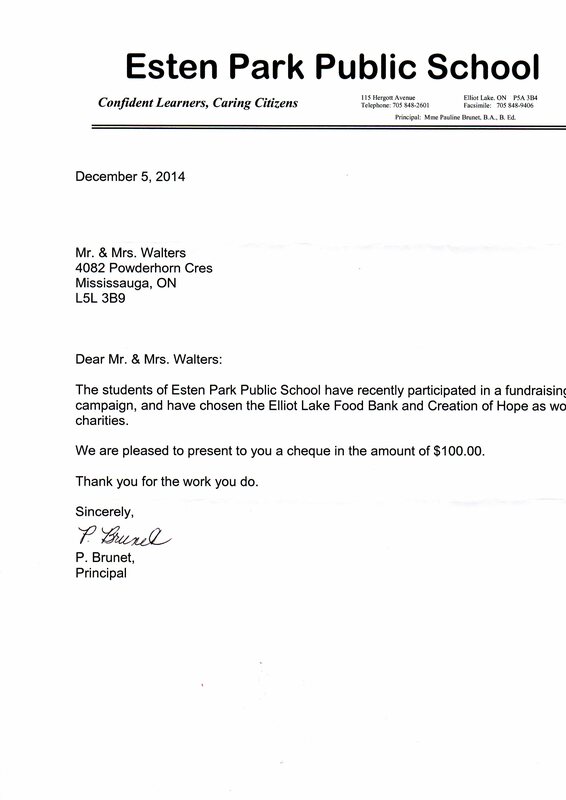 College Heights Secondary in Prince George raised $315.00 as noted in the letter below. Brett Walker’s grade 10 class at St. Pius X Catholic High School in Ottawa raised $100.00. 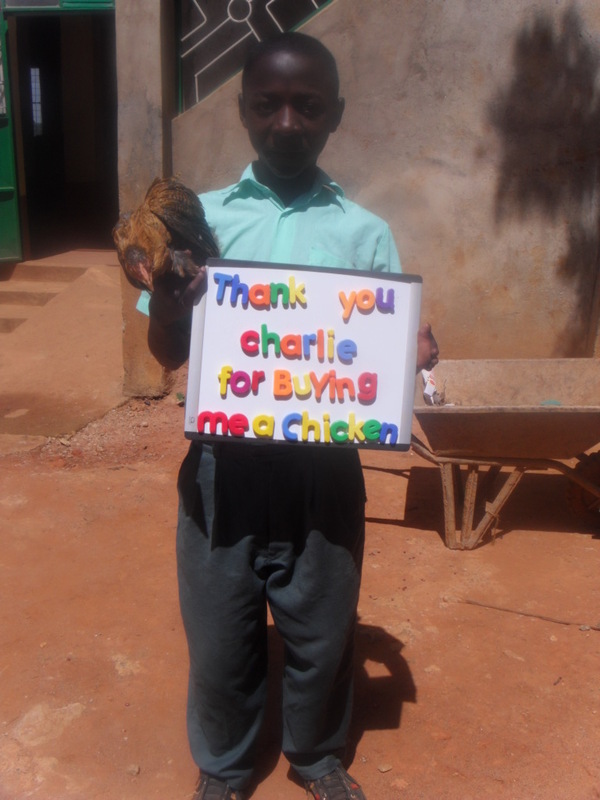 As well his son, Phoenix donated $25.00 to buy 2 chickens. Advance Memorial United Methodist Church – under the leadership of Tonya Evans – Flatwoods, Kentucky, raised $75.00 for a goat and set of tools. St. Mildred’s-Lightbourn School donated $250.50 to be used for education costs for our high school and post-secondary students. Esten Park P.S. – $100 for a day of support of Rolling Hills Residence. Marina Cohen made a donation to be put toward education costs. Diane Middlemiss made a donation to pay for one day of support for The Rolling Hills Residence. Barb Kettle – one of our long term dedicated supporters – sold $225.00 worth of Grannie Bags at local craft sales. At the end of a presentation a student, Dan, pulled $2.00 from his pocket. Those donations always inspire me! 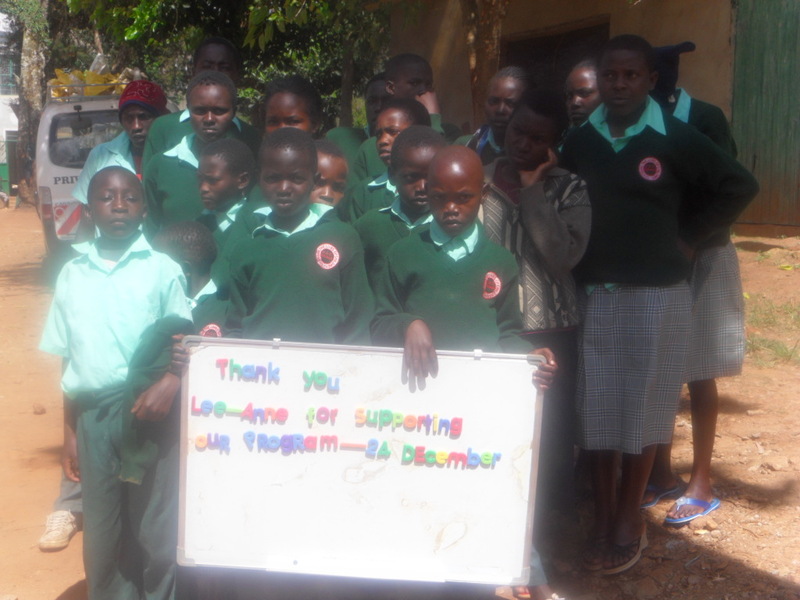 Lee-Anne made a personal donation that supported the Rolling Hills Residence for one day. Wendy and Larry Leigh made a donation to support the Rolling Hills Residence for one day. Marc Stevens made a large donation to be used for education. Linda and Robert Ford made a generous donation. Debbie and Amanda donated funds to be used for assorted items. Sally Briggs made a donation to be used for education. Ashley Polovniak made a generous donation in honor of Wes to be used for education. Karen Danderfer made a donation that will be used for education. Jake Watson made a donation to the program. Along with the support listed below we had our regular sponsors donate over $5000.00 to be used to buy special Christmas presents for their children and to provide for Christmas celebrations for their for their extended families. $100.00 provides support for the entire Rolling Hills Residence for one day. This is food for 55 children, routine medical care, school supplies, the salaries of the driver, night watchman, tutor, cook, matron and patron and the utilities for the building. 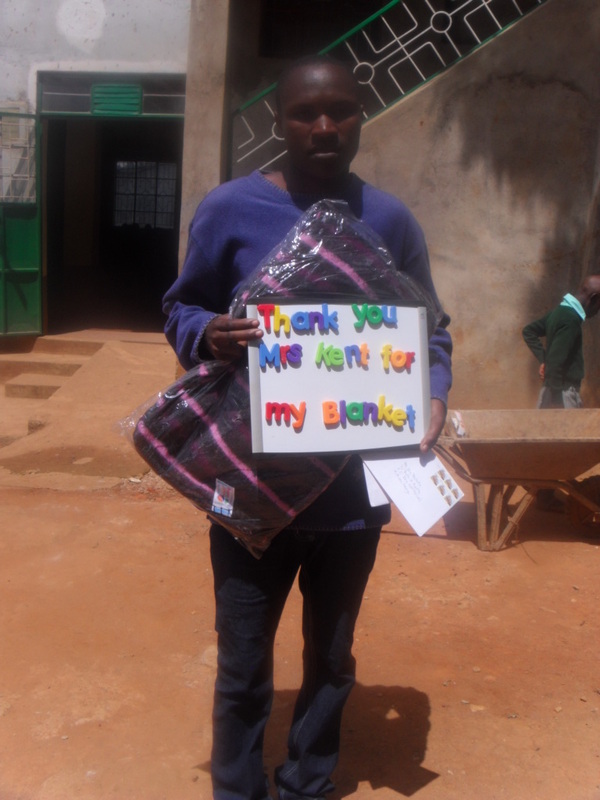 Every month there is a distribution day to the orphans and extended family members in the community. This involves food, tools, livestock, school uniforms, lanterns and additional things needed by the families. Between our orphans and destitute children who reside in their family compounds these resources provide for around 300 children. 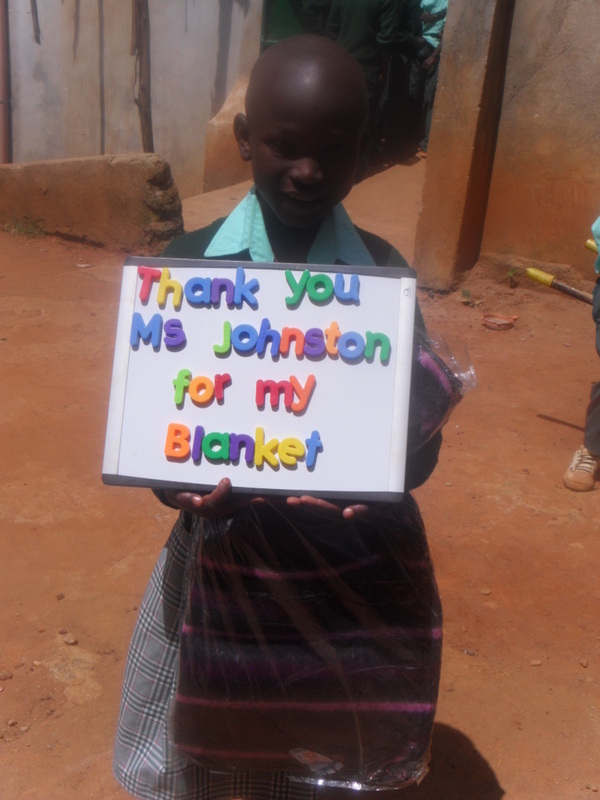 While most of this cost is provided through our sponsors and the support they provide for their child(ren) there is always an extra cost associated with the additional unsponsored children. 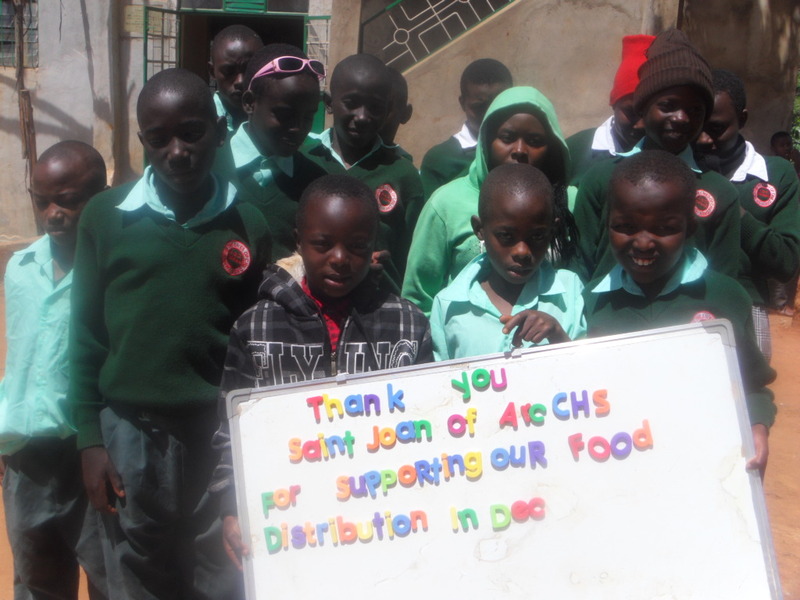 This was covered this month by St. Joan of Arc Catholic High School! Nine times each year the distribution is done by our staff going to three or four designated meeting places in the region. Three times a year there is a gathering on the grounds of the orphanage. These are joyous celebrations which often have 300 – 400 people present. A meal is served for all prior to the distribution taking place. 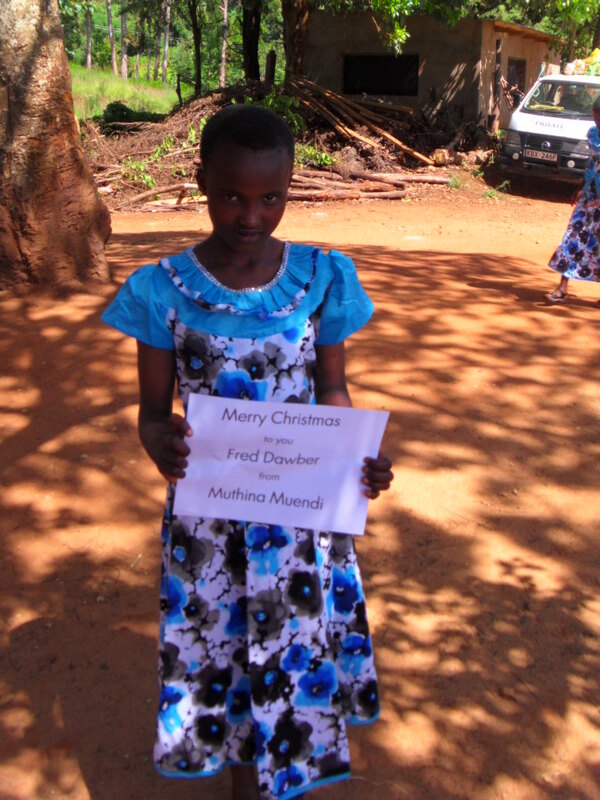 Christmas is one of the occasions where the gathering takes place at the orphanage. 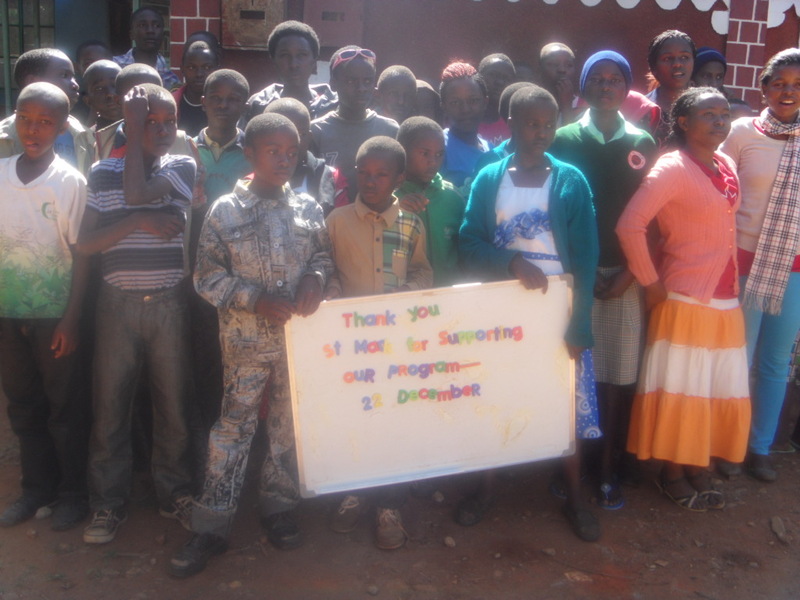 Below are some of the thank you pictures for donations. We work to also send by email a picture directly to the donor. 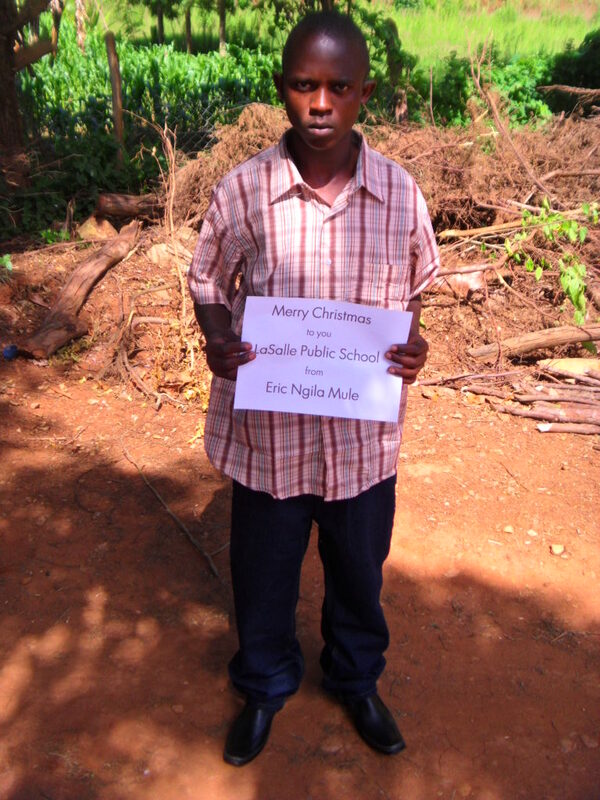 At the end of December – the end of the school year – we had 42 students in high school or post-secondary studies. The new school year begins in January for most students but those entering high school in grade 9 begin their studies in February and university students later in the year. We are estimating that we will have 50 or 51 students who will be in these programs in this coming year. 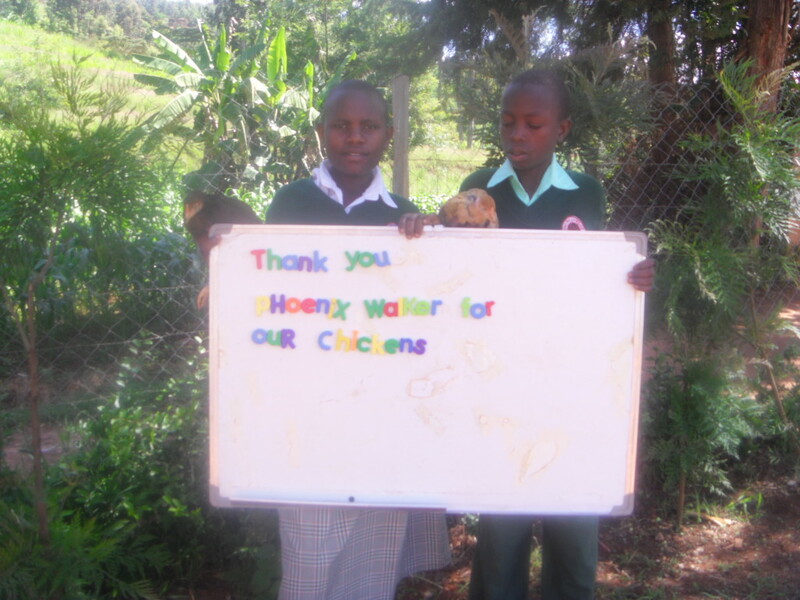 Education remains one of our priorities as well as one of our most expensive outlays of funds. We spent a great deal of time and effort in providing additional tutoring for our students through the primary years. This has paid off in terms of students obtaining high marks and qualifying for higher level – and more expensive schools. 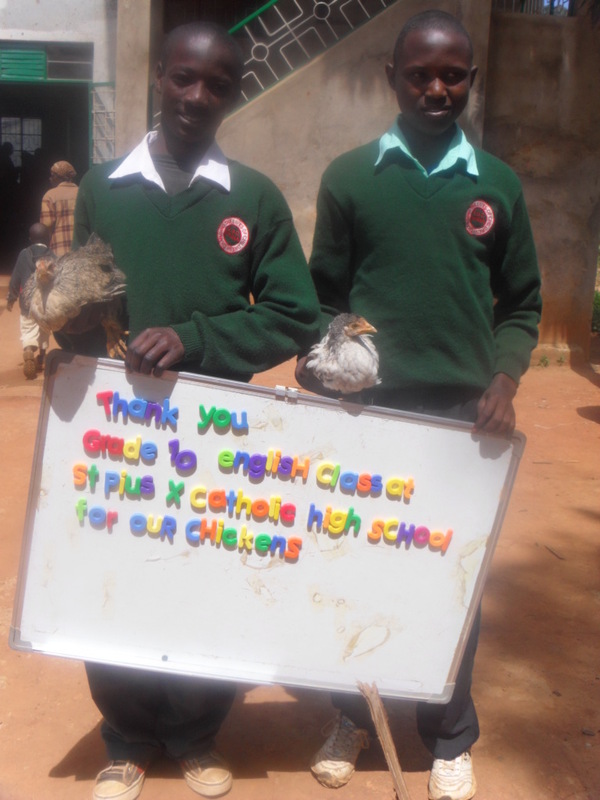 The cost of these schools often far exceeds the funds that are donated by sponsors. To compensate for this shortfall we have launched a program where individuals or schools can become the educational sponsor for a child/student. 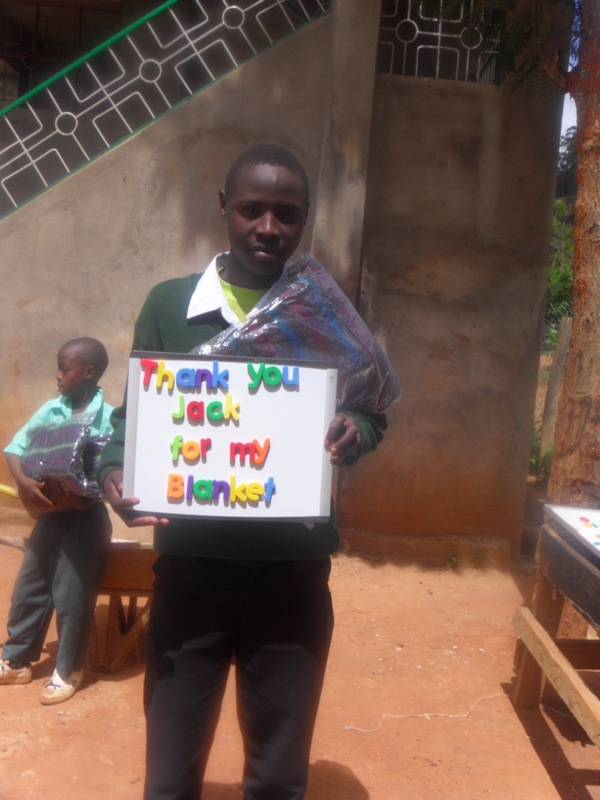 They become a partner with the sponsor to provide for the funds necessary to care for, and educate, that child. Always this is done with the full knowledge and agreement of the sponsor. While we are no longer accepting sponsors we are actively engaged in trying to recruit educational sponsors. 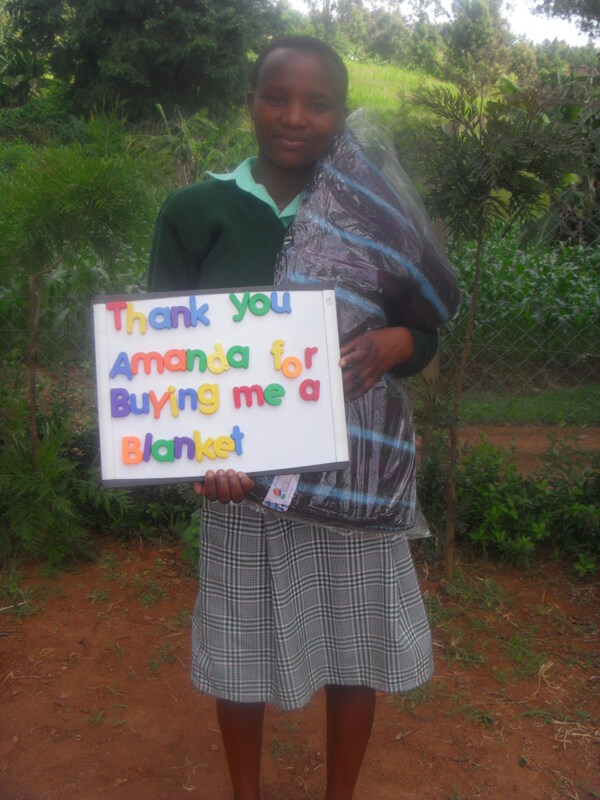 If you, or anybody you know, would like to become an education sponsor please contact Anita Walters at anitaawalters@gmail.com – please note the extra a after the word Anita. 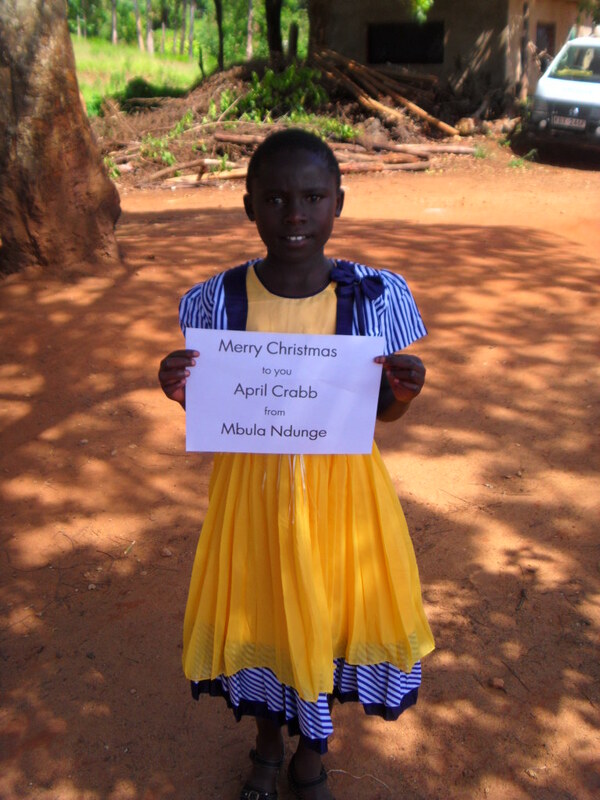 Almost all of our 118 sponsors received a picture and greeting from their sponsored child. 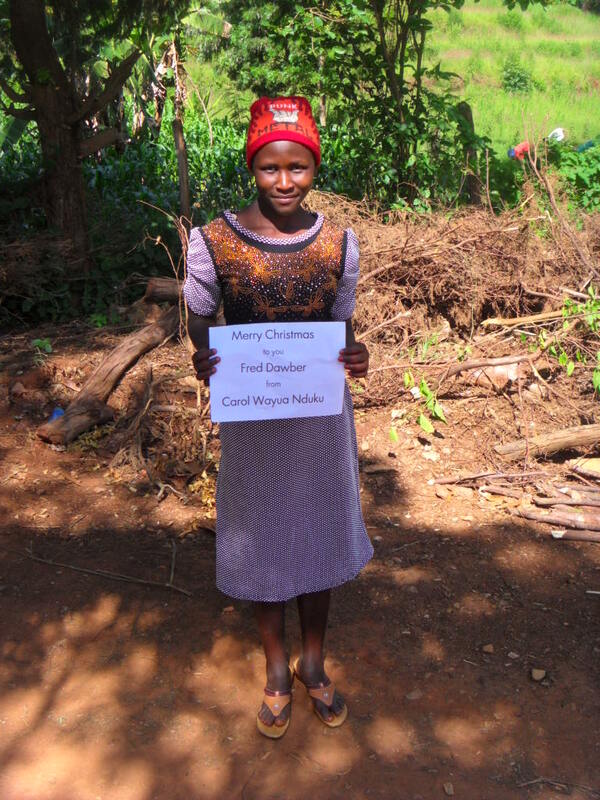 Ruth worked incredibly hard to send these pictures and they were received either just before Christmas or on Christmas morning. 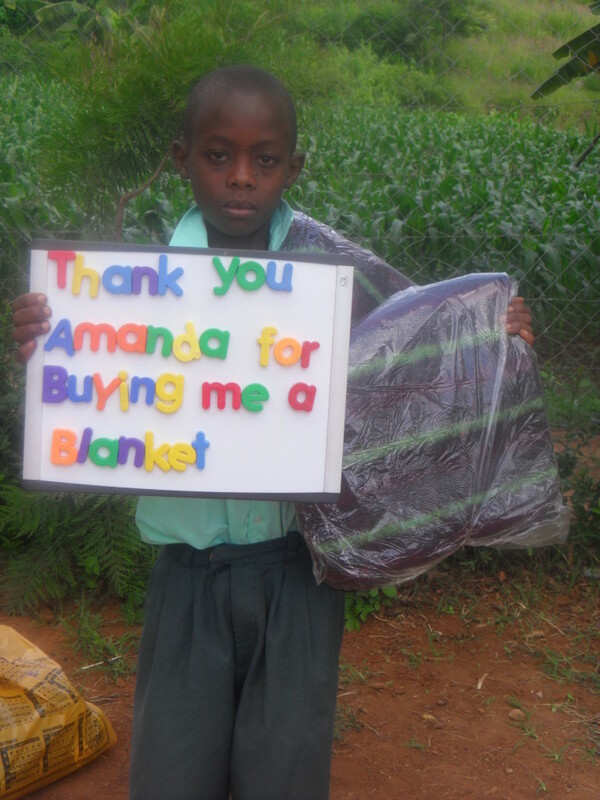 Some sponsors emailed to say it was their favourite Christmas present! Here are a few of the pictures! 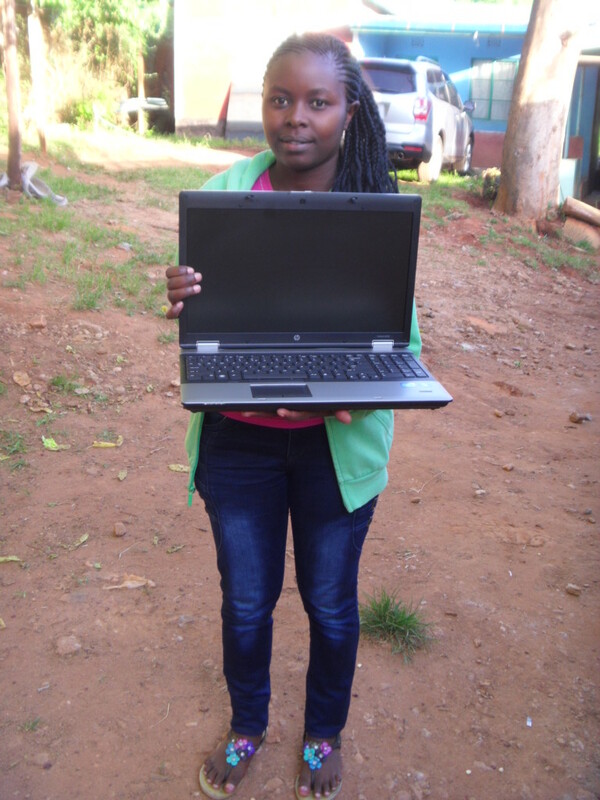 Faith, in first year university, was greeted by a gently used computer! As you can see by the T-shirt she proudly wears she is supported by the wonderful students of LaSalle P.S. in Windsor. 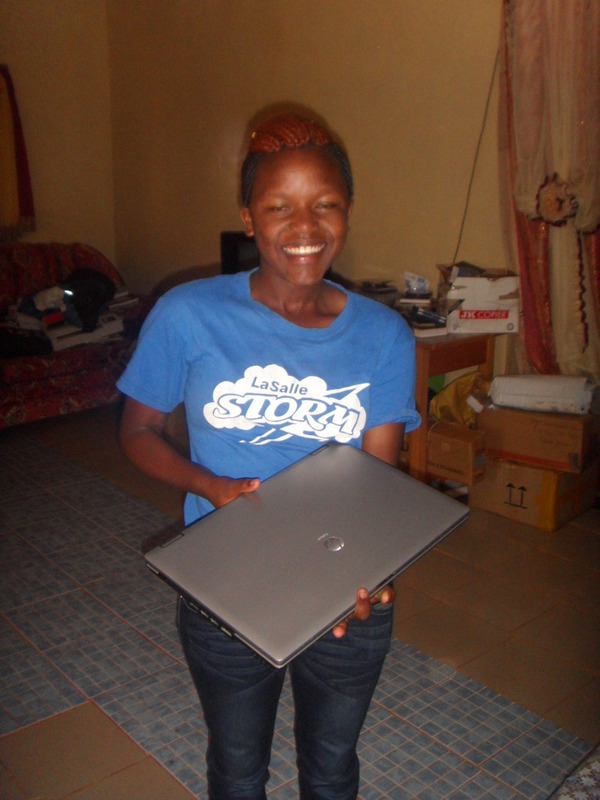 Sarah – also in first year university – shows off her computer paid for by Steve Hilb and his family. 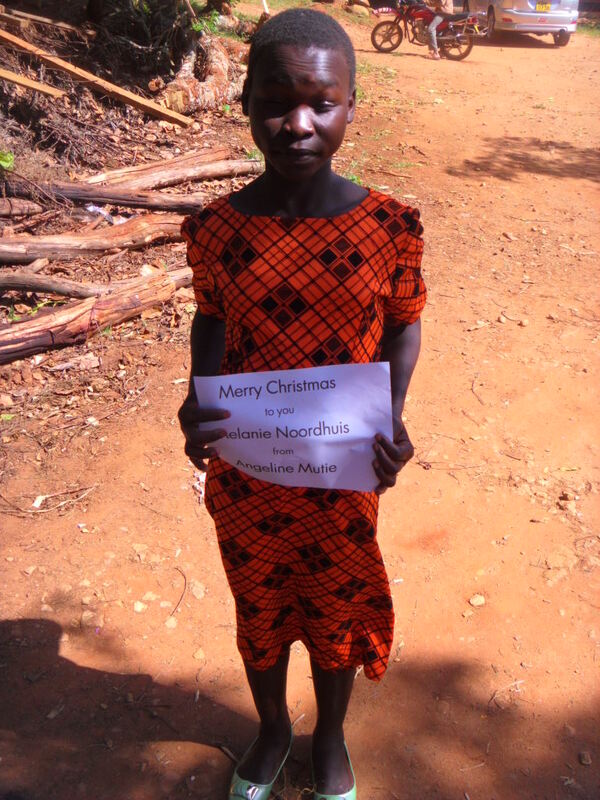 Sarah is sponsored by Lou-Anne and family. As we end one year, we begin another. 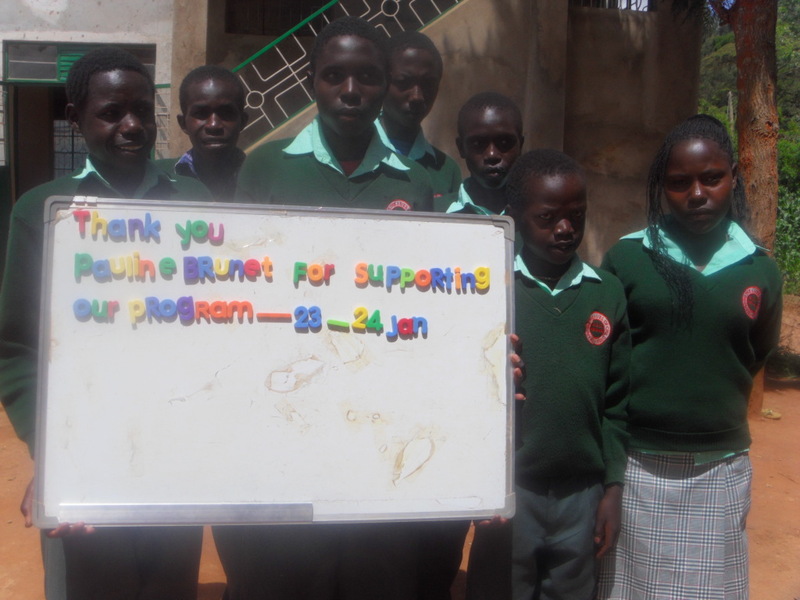 Our program is in solid shape thanks to the generosity of our sponsors here in Canada, The United States, Germany, England, and of course, in Kenya. We have been able to meet our yearly expenses for the program, for ongoing projects, and have established a healthy reserve fund to provide for emergencies. We will keep everybody up to date as we transition from our initial partners, AIM, to a new partner in the coming months. We are so fortune that a number of other organizations have said they are willing to become our partner and we are assessing which of these will be best suited to the needs of our program, sponsors and orphans. Great thanks to all who have supported, and continue to support our program. We hope you have a joyous year ahead!